One of the truisms of collecting, whether you are Imelda Marcos hoarding shoes or a 21st century gentleman acquiring classic cars, is that enlightenment comes with possession. You research your subject, speak to fellow collectors, make an acquisition, and, through the circle of friendship and contact endowed by possession, acquire more and better knowledge. Thus it was with my Ferrari Testarossa. The fabulous looking 1980s supercar is still being fettled to perfection by Joe Macari Ferrari, the celebrated London dealership. Joe Macari has the reputation as one of the most exacting, and most expensive, places to set your classic right. In the course of my conversations with their chief guru (gurus are essential in this game), Andrew Gill, head of aftersales and a man long-term Ferrari aficionados regard with awe, a new dream came into view. It started when I told him , slightly playfully, that having acquired a Testarossa I was now interested in its successor, the 512 TR, a car that was basically an improved version of the Testarossa: looking just as beautiful (and almost identical), but better to drive. It is also, and this is important for a classic car’s value, rarer. There were 7177 Testarossas made (though mine is one of the 438 UK, right hand drive models), and just 2280 512TRs. 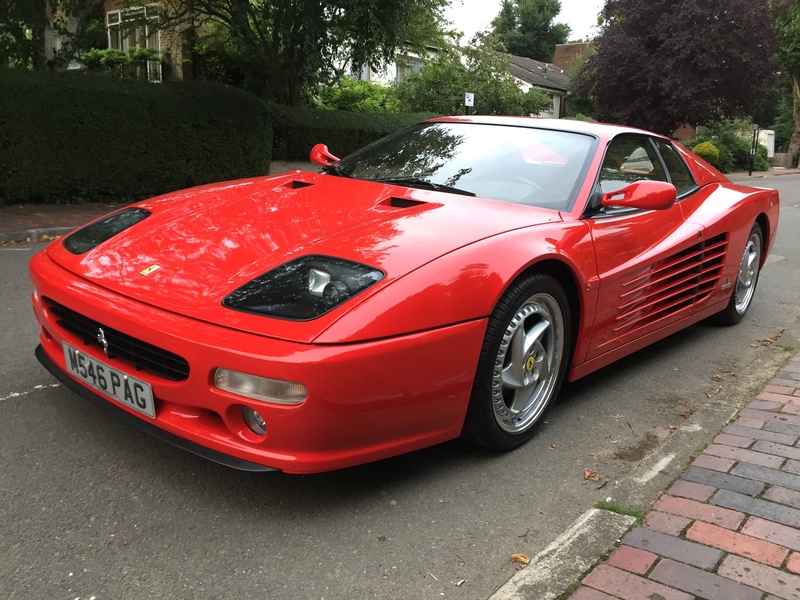 Forget the 512 TR, Andrew said: the 1995-1996 512M was the car to have. “Amazing car. They ironed out all the faults and they drive like nothing else.” Another friend, a very big and respected collector, gave it the nod also and said he’d even go halves with me if I found one. The 512M was the final iteration of the Testarossa series, and one of the most outrageous looking Ferraris ever. It was given a dramatic aerodynamic makeover which divided opinion at the time (I remember thinking at the time it looked cool and fast, but no longer like a Testarossa) but now looks slick and modern, 20 years on. And its mechanical credentials were legendary. Essentially, the 512M was a racier, lighter, faster and more hi-tech version of the 512TR, down to the engine’s titanium alloy connecting rods and variable pitch valve springs. It was Ferrari’s flagship. When it came out, it was the fastest Ferrari and for a while the fastest car in the world. It was also a beast, the last mid-engined production 12-cylinder Ferrari, the end of a line that started with the 365 GT/4 Berlinetta Boxer in 1973, with all the flamboyance that implies. Its successors, from the 550 Maranello to today’s F12, all have engines in front and are far more sober looking. And there were only 501 made, in the world. I really wanted one. But where to find one? Calls to friends in the Ferrari universe saying I wanted one received replies of the “so does everyone else” variety. Someone knew of one coming from Japan; no, already been sold. A classic dealer had one advertised in southern Germany, but he wasn’t getting back to me and, no, sold weeks ago. A friend in Switzerland knew of a friend who had one, but values were going up and he wasn’t selling. One in Holland: but lots of miles and looked a bit tired. One at auction in London, but it was missing a lot of history. If you don’t have history, you have to take the mileage and the fact that it has been maintained properly on trust. One evening, an ad popped up on an alert from an Italian website I subscribe to. Yellow 512M, great history and condition, low miles. I rang the number. “So sorry,” said the owner, a gentleman I would guess in his 70s. A dealer had seen the ad hours earlier, come over with cash (more than 200,000 euros in cash!) and taken the car. When dealers rush for cars, you know they’re hot. Two days later, on a Friday, another alert, this time from a Spanish specialist site, a car in Barcelona. Pictures, obviously taken by an amateur, of a car on a sunny hillside. 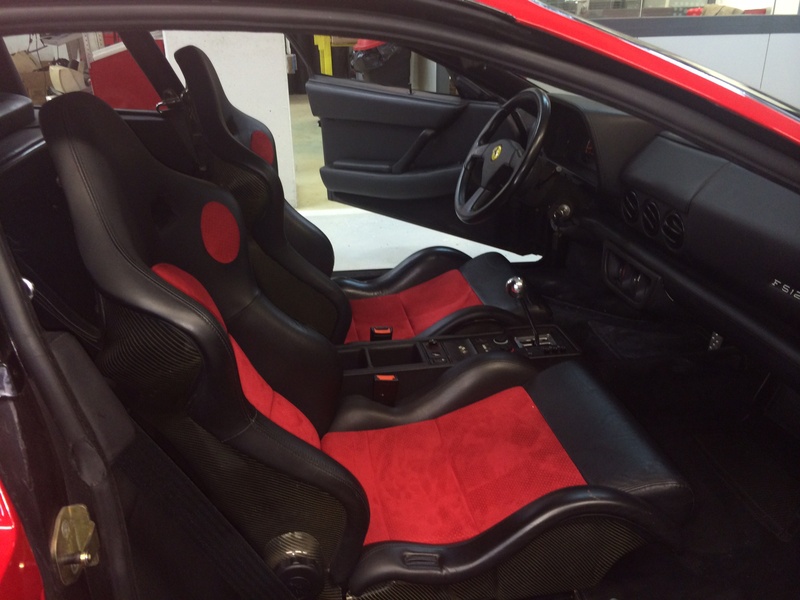 Ferrari Red (rosso corsa) with red and black carbon fibre racing bucket seats, a rare option. Only 12,000 miles, a 1995 car, always serviced at a main dealer. An even better car. I dropped the iPad and rang. “Yes, there are lots of people calling,” said a distinguished voice in Spanish. “Dealers, who don’t even speak Spanish!” (a disgusted tone). “I am going away until Tuesday night”. The ad only stated a landline, which meant nobody would get through to him until then. I’ll meet you on Wednesday at 9am at the Ferrari dealership in Barcelona, I said, to get the car inspected and seal the deal. He agreed. Nobody would be able to get there before me, or would they? On the Tuesday evening, I flew out to Barcelona and settled in at the Majestic. I had to finish some work, and then drank a couple of cocktails by the (closed) rooftop pool. What if he didn’t show up? What if someone else had managed to get hold of him and put a deposit down sight unseen on the phone, common with such desirable cars? What if the car was not as good as advertised? Did I really want to spend this money on a car which, until last year, had just been another old money pit? Was I ahead of the market or a sucker? A. wasn’t answering his phone. A., a scion of Barcelona society in his late-sixties, was delightful. I looked over the car in detail, a list of tips in my hand from both Andrew Gill and the experts on the Ferrarichat online forum. We agreed a price, subject to a full formal inspection by the dealership. I gave him a copy of one of my magazines containing a feature I had written about Ferraris. He zoomed off and came back with a full set of bespoke Schedoni luggage for the car, which hadn’t been mentioned before (market value, more than £10,000). He threw it in for free. We left the 512M with the dealership and he took me for the finest paella I have had, and then a tour of his cars at his stunning modern hillside home (next to Neymar’s house) and in his storage garage. The 512M was neither the fastest or finest of his possessions. We spoke in a blend of French and Spanish, and I pondered that any English or German dealer who had rung A. would not have been able to communicate. He received several messages about enquiries about the car. The dealership rang me. “We’re emailing the results through,” they said. These included a compression test, which doesn’t lie. It was perfect; as beautiful an example as you could dream of. We shook hands, I transferred the money and boarded a flight to Switzerland for a business meeting the next day, with the elegant gentlemen of Ferrari Barcelona looking after the car for us. A couple of weeks later, my 512M arrived in Britain. I entrusted it to Roger Collingwood of The Ferrari Centre in Kent, a former racing mechanic so honest he needs to be reminded by customers to send his invoices. It passed its UK inspections with flying colours and received a number plate. I took the train out to Kent to drive it back to its London garage home. The flat-12 engine rumbled behind my ears like a pair of growling hunting dogs. The steering told you everything about the road and more – it has no power assistance and is heavy and astonishingly direct and real compared to today’s cars. The gearlever is grumpy and obstructive when cold but slashing it through the bare metal gate is a joy in itself on the go. The carbon fibre seats are amazingly comfortable. At speed, around corners, it feels on edge (with a big 12 cylinder engine behind you) alive like no modern car and just a little bit dangerous – it has no traction control of any kind, apart from the driver. And the howl when you take those lightweight pistons towards the top of the rev range is properly frightening – you feel this is why they made the car. Even idling, you are always aware of those two angry mastiffs behind you – I keep wondering if a superbike is dawdling by the rear three quarter flank of my car, only to realise it’s my own engine. While it is now 20 years old and not as fast as any of today’s Ferraris, it feels very fast because it’s so raw, and it is still a properly quick supercar (200 mph, 0-60 in 4.1 seconds). Its value has also risen 50% in the six months since I bought it. A is happy, as I paid a strong price at the time; we went to his wedding last month. I don’t intend to sell it anytime soon; it is one of the greatest Ferraris ever made, and I recommend tracking down one of the remaining 500 or so in the world before the prices hit the moon. Meanwhile, the bug hit again. The 512M’s successor, the 550 Maranello of 1997, was as different as it is possible to be: front engined, understated, wearing a Milanese suit rather than a Versace shirt and Gucci loafers. But a magnificent car, even more powerful, and apparently much easier to handle. Prices seemed very low. With two outrageous Ferraris for those Versace moments, I needed something sober suited and sleek: bespoke Zegna. Time to start looking for one.